This soothing personal foot sauna is solidly constructed from red cedar. When addressing your stress, don't forget about your feet! 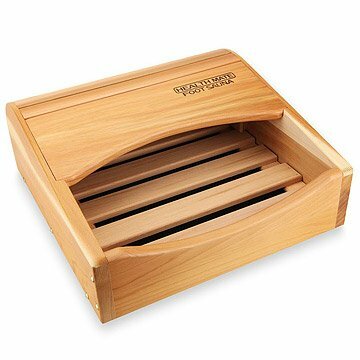 After a long day--or even at the office--relax those tired feet with the soothing warmth of this personal foot sauna. Made of carefully-selected, responsibly certified Canadian red cedar, it's a well-constructed piece to provide personal indulgence for years to come. The sauna's patented, low-EMF heater with custom heat settings ensures efficient and versatile operation in a compact and attractive unit. Made in China. Read all safety instructions, warning and cautions in owner's manual before operation or installation. It is recommended that users consult with their doctor prior to the use of this product. Electrical Specifications:120 Volt / 56 Watt / 15 Amp.